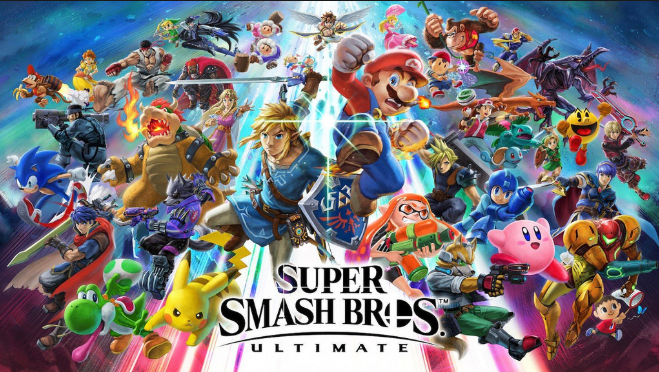 Hayden strain reviews his excitement to get his hands on the fun game "Super Smash Bros Ultimate". A preview of just a few of the characters in the Nintendo video game. Ever since the Nintendo Switch has been launched, most people, including me, have wondered when the next installment for a certain game would come out. This game involves the player’s character fighting amongst other characters in an arena-style brawl. Super Smash Bros is a platform fighting game made by Nintendo that began way back in 1999 on the Nintendo 64 and has continued into the company’s next systems. Once Super Smash Bros Ultimate, the more recent addition to the series, was released, I couldn’t wait to get my hands on it. After all of the hype, I had high hopes and luckily, the game didn’t disappoint. When I booted the game up for the first time, I was greeted with this thing called a Spirit, which was a picture of a character that gave me special abilities when used. I decided to look at the roster only to find there are 8 characters on screen. It’s shocking to see for many first time players, however, this is intentional because you, the player, has to unlock all 74 fighters from the very start. It sounds crazy, I know, but don’t worry. All you need to do is play through the game normally, and eventually, more fighters will appear as you learn the basics of Super Smash Bros Ultimate. The gameplay felt exhilarating due to matches feeling fast-paced and engaging. Controls are very simple to learn since there are two attack buttons, a normal and special, shield, and grab. Stages are unique in that depending on which one you choose, hazards will appear which can make battles more exciting. One minute, the stage is flat with some platforms on it, the next, it begins to move, causing you and your opponents to move along with the stage so that you won’t get moved off the screen. Going back to my experience, I played around in some of the few modes in the game, which were fun to play through. There’s a classic mode which has you fighting through rounds of enemies leading to a boss at the end, an online mode for more competitive players, and a story mode which lets you roam around in a world and fight numerous amounts of enemies. There is also the spirit board which lets you fight the previously mentioned Spirits by fighting unique fighters with special abilities. Overall, I thought that Super Smash Bros Ultimate for the Nintendo Switch was a blast or, dare I say, a Smash. With decent modes to go through, a huge roster of characters to play, an excellent soundtrack to listen to, and some genuine all-around fun, I would highly recommend picking this game up for anyone that has any interest.